With the winter season in full swing, coaches know which players they can rely on to step up and help deliver a win. 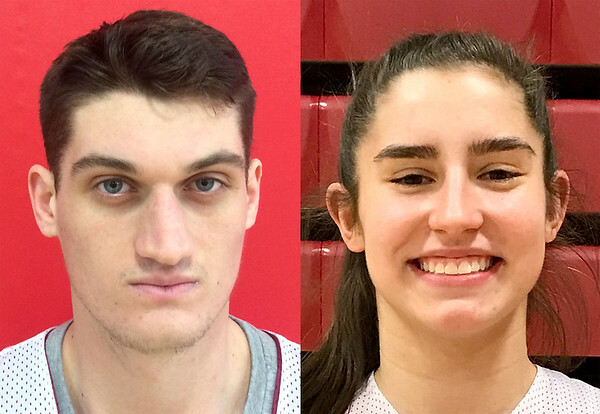 Berlin’s Mike McCarthy and Lyzi Litwinko both come stepped up their performances in the last week to help their teams come out on top. After being pushed around the court in a loss to St. Bernard over a week ago the Redcoats pushed back harder for a 75-63 win over Conard last Wednesday with McCarthy was leading the way. The senior scored 17 total points, tying with fellow Redcoat Dylan Fisk, for team highs of the evening. The 6-foot-4 forward and shooting guard uses his size to his advantage and finished his night with pulling down a majority of the 20 rebounds Berlin had. “Using my body and my strength helps me a lot on the court, especially when it comes to getting rebounds,” McCarthy said. He then followed that game up with a game-high 24 points in the 61-55 win over Maloney Saturday afternoon. McCarthy has a tremendous amount of potential, Berlin head coach Mike Veneziano said and the losses of Spencer Duke and Jack Lynch to graduation has allowed McCarthy to flourish in his new role. The Redcoats currently sit 4-2 on their season and will see Platt today at home at 6:45 p.m. The Berlin girls basketball improved their season record to 3-4 Saturday afternoon when the Redcoats beat Maloney 37-28. The Redcoats were trailing 13-12 by halftime, but were able to pull away in the second half thanks in part to the play of Litwinko. The sophomore guard put away 20 points for Berlin and came away with nine rebounds as well. On the season, Litwinko is leading the team in points scored, assists, rebounds and blocked shots. Litwinko has started every single game since her freshman year and due play on the court as well as her demeanor off it, is one of the team’s three captains despite being just a sophomore. The Redcoat will be back in action tonight at 6:45 p.m. at Platt. Posted in New Britain Herald, Athletes of the Week, Berlin on Monday, 8 January 2018 22:44. Updated: Monday, 8 January 2018 22:50.